“DOIN R THING” IS A GREAT BOAT FOR A GREAT PRICE. THIS BOAT IS PRACTICAL, VERSATILE AND AFFORDABLE. EXCEPTIONALLY WELL LAID OUT INTERIOR AND DECK PLAN MAKES THIS BOAT SEEM LARGER THAN 28'. 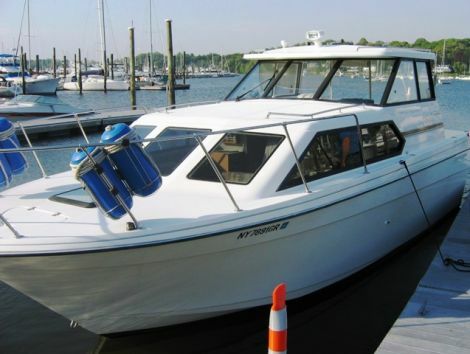 CABIN FEATURES FULL GALLEY, CONVERTIBLE DINETTE, PRIVATE HEAD WITH SHOWER, LARGE V-BERTH. THE AFT CABIN FEATURES A DOUBLE BERTH, HANGING CLOSET, REAR FACING HATCH. DEEP COCKPIT IS GREAT FOR KIDS OR ENTERTAINING FRIENDS. REAR TRANSOM DOOR OPENS TO SWIM PLATFORM AND LADDER. ADDITIONAL FEATURES INCLUDE: BATTERY CHARGER, VHF RADIO, AM/FM/CASSETTE STEREO, WATER HEATER, HYDRAULIC TRIM TABS, BOWTHRUSTER, REMOTE SPOTLIGHT AND PLENTY OF STORAGE THROUGHOUT. POWERED BY GM 7.4L MPI ENGINE WITH BRAVO II DRIVE. HAVE MANY PHOTOS AND DETAILED DESCRIPTION AVAILABLE.